Football is very popular in Iceland. Our national team has not won any special cups or anything like that but the team now is better than ever. This year is the second time Iceland has the chance to get to the world cup. Famous football players are e.g: Eiður Smári Guðjónsson , Eyjólfur Sverrisson and Gylfi Þór Sigurðsson. Eyjólfur has played with Stuttgart and became a German champion in 1992. Eiður Smári Guðjónsson has played with the some of the best teams in the world , Chelsea and Barcelona he won the champions league with Chelsea in 2006. He has also played with smaller clubs. Gylfi þór is a rising star he has a big part in Tottenham since Gareth Bale left the team. In our home town football is the favourite sport. Sindri is our local team and plays in the second league which is not bad based on the town’s population. There are a lot of football fields to train on and one fantastic football field for matches. When the Icelandic national handball team is playing everyone in Iceland is watching and it is the sport that everyone in Iceland loves. In the year 2008 the team got the silver at the Olympics. We have many famous handball players but the best handball player in Iceland is Olafur Stefánsson. He has played with many teams over his career. He was the Icelandic captain in Beijing in the 2008 Olympics where they got the silver. And he was the captain in the 2010 European Championship where Iceland finished in third place. Ólafur has won over 50 cups ore tittles for example Icelandic top sports man ore top scorer in the league. He is the most successful Icelandic sports man ever. Unfortunately handball is not played in our home town. Fun fact: Ólafur has a brother and his name is Jón Arnór stefánsson and he is a well-known basketball player. Pétur Guðmundsson born in 1958 was the first basketball player in Iceland to join the NBA team. He played with Los Angeles Lakers and San Antonio Spurs. He also played in England and Argentina Jón Arnór, Olafur‘s brother is the second Icelandic player to join the NBA later on he won the FIBA Europe cup with Dynamo ST Petersburg. He was the first Icelandic basketball player to win the FIBA Europe cup. Icelandic women senior and junior team in Team gymnastic were European champions in 2010 and 2012. Also they were northern champions. They were the first team to do some of the jumps they did.There are some other good athletes like Aníta Hinriksdóttir. She became a 800meter world champion in Ukraine and was way ahead the other competitors. In Iceland we respect all of our athletes and also those who have disabilities. There are not so many countries that show disabilities sports on television but Iceland does. Katrín Rós Hákonsdóttir is disabilities swimmer. She is a multiple world champion. She has been chosen the best Icelandic sports women in 2006 for the 12th time. Former FAS student Sveinbjörg Zophoníasdóttir has set her goal on making it to the Olympics 2016 in Brazil and will competing in Athletics sports. 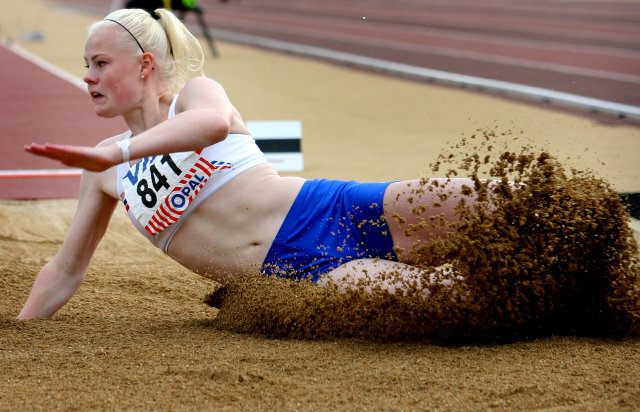 She was in third place in heptathlon (sjöþraut) in the European cup tournament (E.M) in 2013. She also won the gold in Iceland. Icelandic wrestling is one of the oldest sports in Iceland. It is unlike all other wrestling. It’s about tackling down your opponent. Each player has a belt on them, you hold on to the other player‘s belt and try to tackle him down with your feet or your force of your body if your opponent falls down you win but if you go down with him then you just go again until one player wins.